Mizzi Studio was commissioned by artisan brand Colicci to design a unique café for the main entrance of Westfield Stratford shopping centre, leading from the Queen Elizabeth Olympic Park. The café embodies Colicci’s affinity for the organic and its undulant form blurs boundaries between architecture and public sculpture. With this project, we set out to push the boundaries of sculptural form and material manipulation. Its tour-de-force is a swelling copper roof, which seemingly floats above the glazed pavilion below. Its surface is made using a combination of an 18th century sheathing technique and computer-aided design. We developed a digital skin, then divided its surface area into virtual tile segments that translated to laser-cut sheets. The result is a bespoke jigsaw of 542 copper pieces that were assembled by hand with a pneumatic gun and 20,000 rivets. Patinated finger prints and hammer marks were left to give an earthy texture. 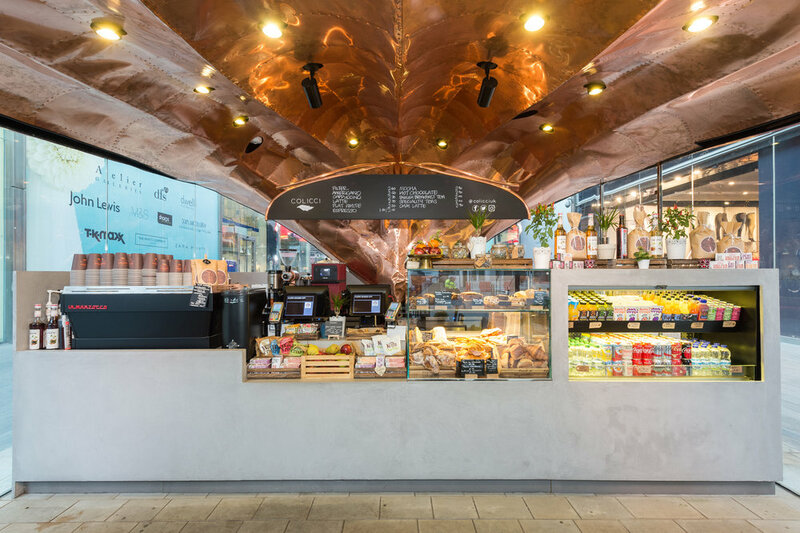 Designed to mimic the mouth of an orchid, the captivating entrance and canopy is shaped to lure visitors in to an immersive copper cocoon turning cafe culture into an an awe-inspiring, fun, warm and surreal customer experience. Due to the prominent location of the site, the design needed to welcome visitors to Westfield and create a lasting impression. The combination of its neo-futuristic form and innovative use of copper results in a functioning café that acts a work of public sculpture.